I recently spoke with the American Management Association about my book, Learning to Succeed: Rethinking Corporate Education in a World of Unrelenting Change — I hope you’ll listen in. Here’s a quick preview of our conversation. First, we are experiencing a rapidly expanding global market. Regional boundaries are evaporating. For example, a regional glass manufacturer out of southern New Hampshire is all of a sudden competing with a company based in Stockholm. Second, the market is operating on shorter and unpredictable business cycles. As globalization and competition intensify, timelines for production cycles get constricted. So companies have less time in a cycle to research and develop and bring products to market, as they are in a race for that valuable share. And, with globalization, we see an increase in the impact that socio-political conflicts and force majeure events have on these types of constricted cycles. And third, we see increased ROI pressure. Given the new normal market environment, we see executives focusing much more on short-term profits—especially given the uncertain business and global environments they are increasingly being forced to operate within. This new economy will be untenable without continuous learning effectively in place in your business. In this new economy, it is imperative for companies to align strategic plans with complementary learning initiatives. In my book, I introduce CILS, or, the Contiguous Integration of Learning and Strategy. 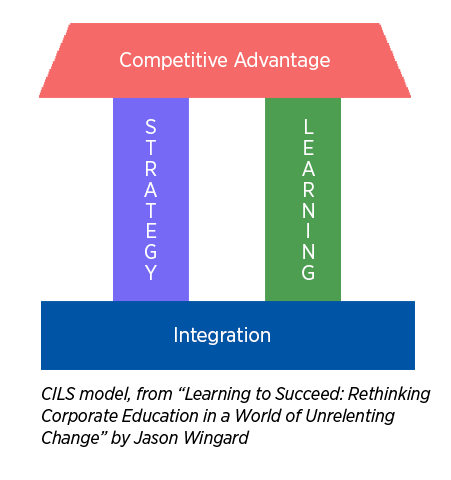 CILS is a comprehensive integration formula and model which is the optimal way for corporate strategy and corporate learning to work together for success. Or better yet, for survival in this new competitive corporate economy. I hope you’ll give my interview with the AMA a listen here. If you are looking for some inspiration on implementing learning programs at your organization, please do check out my book. And consider leaving a review if you’ve read it and found it useful.